Regardless of typology, size or scale, choosing to use color as an influence in architecture and design makes its own bold statement. Color is essential to our everyday lives. Color is stimulating and soothing, thrilling and expectant, cultural and magical. In our manmade explorations in the spaces in which we work, play, learn, and live, color is part of our everyday lives. While there are countless scholarly treatises on color harmony, color theory, color relativity and psychology, the heroism of color in architecture has been an oft neglected aspect in design. Let your project demonstrate the visible and tangible influence of color in architecture as a major force and design consideration. Global authorities on color influence fashion, trend, and design. They provide us with colors of the year and dial-up hues. Understanding how colors can be used and interpreting color forecasts supports the art of color: how color and light are formgivers to architecture, how color enhances context and environment, and how it can communicate a building’s sense ofpurpose. Architects and designers work with color as part of their art and craft. They personalize selections that balance the leftbrained intellectual approach of color theory and harmony with right-brained principles that feel emotive, symbolic, and appropriate. Color can deliver architectural, emotional and spiritual intention. Moving through O’Hare’s International Airport often, we like to linger between Concourse B and C. Designed by Helmut Jahn who collaborated with artist Michael Hayden and composer William Kraft, it is the changing light sculpture that captivates us, expanding our perceptions of the airport’s underbelly. Multi-colored metal and translucent tinted glass bands unify the various elements of the Gethsemane Lutheran Church, designed by Olson Kundig Architects, where cross-like forms become a beacon of light and hope, visible inside and out. Strolling under Summer Umbrella in Portugal is an uplifting dynamic experience; its polychromatic umbrellas bring Mary Poppins-like delight to an urban streetscape. 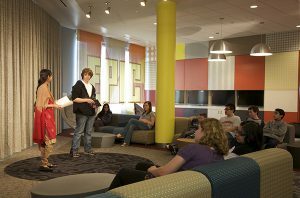 At the Fountaindale Public Library in Bolingbrook, Illinois, one of our own designed and curated spaces provides teens with a Vortex of aesthetics, color, resource, and collection that speaks to their interests and aesthetics. Color can be used symbolically, culturally, and psychologically to define and articulate connections to artful expression. Artists, designers, and architects all have favorite colors. We like to use color creatively. Often, we flout convention. Sometimes, our taste in color is idiosyncratic or we follow the norm. We create color combinations that are beautiful in their context. Color is a visual language, conveying the full spectrum of moods and emotions, from strength and solidity to softness and serenity. Color can be symbol and status, magic and memory. Color can connect and create continuity between design elements, and attract, establishing emphasis. Color is heroic, regardless of typology, size or scale. Choosing to use color as an influence in architecture and design makes its own bold statement. It is brave to design with color. Color makes everyday life brighter, lighter, memorable, and filled with meaning. For the architects and designers within these pages, color is a means of creative exploration and expression,from the exuberant to the emotive. The palette is as limitless as the imagination. Be brave! Color it in! Craving Color? Pick up a copy of Color In Space, where Sharon’s blog originated.